It remains a role that I am waiting to fill. Let me explain. Although I meet many outstanding best men in my role as a DJ, I also meet many who are too nervous to deliver the toast, too drunk to assist a groom in need, and too disinterested in the role to be of any use. Besides, why burden your best friend with this role if all he wants to do is have a good time at the wedding as well? Instead, hire me. Your professional best man. What, you may ask, are my qualifications for such a job? I’ve attended more than 500 weddings as a DJ, guest, groom, member of the bridal party, and best man, so there is little that I have not seen. As a result, I will be ready and able to assist in almost every unexpected or unusual circumstance. My experience and expertise will allow me to ensure that the DJ, photographer, caterer and other professional staff are doing their jobs to the best of their ability and serving the bride and groom to my exceedingly exacting standards. I have extensive experience in dealing with in-laws, drunken guests, angry girlfriends, belligerent uncles, and any other potentially disruptive wedding attendee and am adept at deflecting these distractions away from the bride and groom. I can deliver an outstanding toast. I am often instructing tragically unprepared best men on what to say just minutes before their toasts and making them sound quite good. I am a skilled party planner and will give you the bachelor’s party of your dreams while also ensuring that you do nothing that you will regret the next day. I possess a wide range of interests and am skilled at ingratiating myself to a wide range of people. I can do jock and nerd equally well and rarely meet someone who I cannot find common ground. We may not be best friends after your wedding, but for the duration of our nuptials, I will be surprisingly likable and chameleon-like in my ability to blend in with your group of friends. And who knows? One of my best friends is a former client. It could happen for you, too. And what if you want to hire a professional best man but have a friend who also wants the job and would be upset to learn that you went with a professional? No problem. Simply have two best men. One who will get drunk during the cocktail hour, hit on one of the bridesmaids during photos, deliver a humorless speech, and forget to end it with an actual toast. The other will not drink at your wedding except when capping off an amusing and heartfelt toast, will keep your best interests in mind at all times, and is skilled and experienced enough to ensure that everything goes smoothly on your wedding day. Don’t you deserve another friend on your wedding day? A friend absent of personal needs and petty grievances on your big day. A friend who will guide you through and past every awkward, annoying, unfortunate, and potentially disastrous moment of your wedding. Don’t you deserve the services of a professional on your wedding day? Three grooms have attempted to hire me. Two lived in California and one lived in the UK, and their wedding dates dd not align to my schedule, so I had to decline. One groom hired me, explaining that he was marrying a woman whose culture demanded that the best man be an unmarried, never-before-married friend, and he had no one in his life who met these qualifications. I explained that I did not meet the qualifications, either, but he didn't care. He planned to lie to his fiancee and tell her that I was a lifelong bachelor. My wife wasn't pleased, but I agreed. After hiring me and planning for six months, he backed out without explanation. A bride strongly considered hiring me for her husband, who is "a great guy" but lacks any real close friends. Ultimately she decided that it might hurt her fiancee's feelings to hire me and opted not to. At least three television producers - two reality show producers and one documentarian - have contacted me about appearing in their television shows. We explored the possibility in all three instances, but nothing came of it. When The Wedding Ringer, a film about a professional best man, came out in 2015, the actor and star of the film, Kevin Hart, contacted me, crediting me with coming up with the idea first. I await the next step in this journey to make this job a reality. At least once. Music is not the most important part of my job as a wedding DJ. Last night I wrapped up my 19th year as a wedding DJ. When we first launched the business back in 1997, I thought that music was going to be the most important part of my job. Learning to mix songs together with great precision and playing just the right song at just the right moment seemed paramount to me. And yes, it's true. The primary reason I am hired as a wedding DJ is to play music, but every DJ can play the music. Some are better at mixing music and matching beats, but every experienced, professional DJ can play the music with an acceptable level of skill. I have learned that the secret behind our success hasn't been the music but all of the other things that we routinely do during a wedding. I met with the justice of the peace, who was officiating a wedding ceremony for the first time. She was nervous and unsure about certain parts of the ceremony. I've married more than two dozen people over the past ten years (and have watched hundred of other wedding ceremonies), so I was able to iron out some of the wrinkles in her plan and put her more at ease. I met with the best men, who was delivering a toast later that night, and revised his plan a bit, thus ensuring that his toast would be well received and the bride would not feel insulted. I bustled the bride's dress when she lost a button on the back during the reception. I tied the ring bearer's tie after his mother gave up in frustration. I fixed the jammed popcorn maker, thus endearing myself to the dozen or so children at the wedding. During the cake cut, I extricated a small but exceptionally persistent boy from the scene - and therefore from the photographs - by handing him a microphone and encouraging him to turn it on and play with it. By the time he realized that the microphone was never going to work, the cake cut was complete and the problem had been averted. I brought a drink to a father who had been sitting in the same chair for more than two hours with his sleeping toddler flower girl draped over his shoulders. The look of gratitude on that man's face was priceless. I brought the father of the bride his jacket and suggested that he wear it just prior to his dance with his daughter. He thanked me profusely later in the night. I extricated the bride and groom from a lengthy conversation with a "friend of the family" - which often means a friend of the mother and father - by recognizing their desire to escape and providing them with an excuse to do so. The looks of gratitude on their faces were even better. And yes, I played the music, too. It went well. I actually closed out the evening with a series of six well chosen songs that packed the dance floor, including Sweet Caroline, Jessie's Girl, and Don't Stop Believin'. I would've normally played popular songs from the previous year at the end of the wedding, but I recognized early on that this was a sing-along crowd, meaning they were the kind of people who liked to sing on the dance floor as much as they liked to dance. As a result, I ditched the latest Katy Perry and Meghan Trainor songs in favor of more lyrically ubiquitous tunes. It worked perfectly. Music matters. It's just the easy part. Despite our best efforts to retire, we have already booked two weddings for 2016 and more are likely on the way. We no longer advertise or even maintain a real website, but we're the preferred vendor at two of our favorite wedding venues, so we continue to book weddings via these vendor lists. Otherwise, brides and grooms need to know us and be referred to us by a former client or friend in order to book us. It's not the 40-60 weddings a year that we once did. Instead, it's half a dozen Friday or Saturday nights spent with my best friend doing something that we have become quite good at over the course of two decades. And mostly because of the little things that we do to make the wedding day a little better for everyone involved. My daughter betrayed me. I'll say it doesn't hurt, but truthfully, it hurts a lot. Wedding advice: No impromptu toasts. Wedding season is upon us. On Saturday my partner and I will begin our 19th season as wedding DJs. When we started back in 1996, we still had a cassette deck in our rig and had no cell phone, laptop, or GPS. I don’t know how we did it. Almost two decades later, I’ve learned a great deal about the mechanics and etiquette of a wedding. Throughout the 2015 wedding season, I’ll pass on some of my hard earned wisdom from time to time, and if you have a question related to weddings, please feel free to ask. Wedding and receptions are often timed to the minute. An unexpected five minute interruption can cause problems that you cannot begin to imagine. The order in which people are chosen to speak is often decided upon for a very specific reason. The bride and groom, for example, may ask the Maid of Honor to deliver the final toast because she is funny and will alleviate some of the weight of the Best Man’s toast, which references the groom’s grandmother who died two weeks ago. Your unplanned toast may ruin the carefully constructed order entirely. Brides and grooms choose the people to deliver speeches carefully, and they often receive more requests for people to speak than they can accommodate. Oftentimes a request to speak is declined for the sake of time or a myriad of other reasons (If we let you speak, we’ll have to let Uncle Joey speak, and that would not go well). Assuming that your toast will be welcomed and appreciated is oftentimes not correct and can result in the need for awkward explanations later. If the bride and groom had wanted you to speak, they would have asked you to speak. Delivering an impromptu toast or speech is an excellent way of appearing like an attention-seeking narcissist on a day when you are clearly not supposed to be the center of attention. If you want to say something charming and lovely about the bride and groom, do so privately. Propose a smaller, less formal toast when they stop by your table. Offer a private toast when you find yourself alone with the married couple. Or just take the couple aside and say a few words. If your goal is to say a few kind words to the bride and groom, you don’t need the microphone and the attention of every guest in order to do so. If you feel like you need the microphone and the attention of everyone at the wedding in order to make your toast, ask yourself if your toast is less about the bride and groom and more about you. The Professional Best Man: A bride’s best friend, too. Four grooms have attempted to hire me. Two lived in California. Two lived in the UK. Geography and timing (the weddings were taking place during the school year) prevented me from taking any of these gigs. Three reality show producers and a documentarian have contacted me about writing, consulting, and/or starring in a series about a professional best man. Two were in the US and two were in the UK. Kevin Hart, the actor and comedian who stars in the upcoming The Wedding Ringer (based upon the concept of a professional best man), contacted me and acknowledged that I had the idea first. He did not offer any financial compensation. Sure, a man might find himself in need of a professional best man, but it’s equally likely (and perhaps even more so) that a bride might feel that her future husband is in need of a professional best man, too. She may love her man, but does she love her man’s best friend? And even if she thinks that her fiancée's best friend is a great guy, is he competent enough to handle all of the the responsibilities of a best man? Is he going to remain sober on the wedding day? Is he going to plan a bachelor party that will make her future husband happy while eliminating the possibility of alcohol poisoning, naked women, and police involvement? If not, I’m your man. I have met many outstanding best men in my role as a DJ, but I’ve also met many who are too nervous to deliver the toast, too drunk to assist a groom in need, and too disinterested in the role to be helpful in any way. Besides, why burden your fiancée's best friend with all of these responsibilities when all he really wants to do is have a good time at the wedding as well? I’ve attended more than 500 weddings as a DJ, minister, guest, groom, member of the bridal party, and best man, so there is little that I have not seen. As a result, I will be ready and able to assist in almost every unexpected or unusual circumstance. My experience and expertise allow me to ensure that the band, DJ, minister, photographer, caterer, and any other vendors are serving the bride and groom to my exceedingly exacting standards. I have extensive experience in dealing with irritable in-laws, drunken guests, angry ex-girlfriends, belligerent uncles, wedding crashers, and any other potentially disruptive wedding attendee and am adept at deflecting these distractions away from the bride and groom. I can deliver an outstanding toast. I am often instructing criminally- unprepared best men on what to say just minutes before their toasts and making them sound quite good. I am a skilled party planner and will plan a bachelor party that your fiancée loves while also ensuring that he does nothing that he will regret the next day. And what if you want to hire a professional best man but your fiancée has a friend who also wants the job and would be upset to learn that you went with a professional? The other will not drink at your wedding (except if he is capping off an amusing and heartfelt toast), will keep you fiancée's best interests in mind at all times, and is skilled and experienced enough to ensure that everything goes smoothly on your wedding day. Doesn’t your fiancée you deserve another friend on his wedding day? A friend absent of personal needs and petty grievances. A friend who will guide him through and past every awkward, annoying, unfortunate, and potentially disastrous moment of your wedding. I have 15 jobs. So you probably require my services in one way or another. As the New Year approaches and the endless possibilities of the coming year loom on the horizon, I always like to take a moment and reset my current occupational status, in the event that you or someone you know will require my services in 2015. While occupations like teacher and writer seem like fairly obvious inclusions on the list, there are also several less obvious jobs on the list that may seem a little silly at first, but let me assure you that they are not. 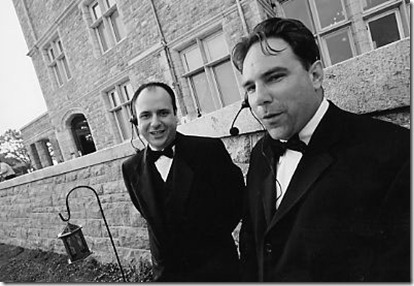 Many people thought it was silly back in 1997 when my friend and I decided to become wedding DJs, even though we had no experience, equipment, or knowledge of the wedding industry whatsoever. We simply declared ourselves wedding DJs, bought a pile of equipment that we didn’t know how to use, and began the search for clients. Nineteen years and more than 400 weddings later, we’re still in business. The same could be said about my decision to become a minister in 2002. Or a life coach back in 2010. Or a professional best man in 2011. Or last year’s declaration that I was a public speaking coach. Or last week’s announcement that I am now a presentation consultant. All of these positions have either become profitable ventures or at least received interest from potential clients. The lesson: If you want to do something, just start doing it. So here is a list of my 14 current occupations and an explanation of my services. I hope I can be of service to you in 2015. Teacher. Sorry. I’ve got a job teaching already, and I love it. But in about four years, a partner and I plan on opening a one-room schoolhouse for students grades K-5, so if you’re looking for a school for your child at that time (or looking to donate money to build the school), contact me. Writer: In addition to writing novels, I’ve also written a memoir, a book of essays, a rock opera, a tween musical, and a screenplay. I’m also the humor columnist for Seasons magazine. I’m always looking for additional writing gigs, in particular a regular opinion column and/or advice column, so if you have a writing job in need of a good writer, contact me. Wedding DJ: My partner and I are entering our 19th year in the business. We’ve have entertained at more than 400 weddings in that time. We’ve cut back on our business in recent years, ceasing to advertise or even maintain a respectable website. Almost all of our business these days comes through client or venue referrals, as we prefer. If you’re getting married and need a DJ, contact me. Storyteller and public speaker: I deliver keynote addresses, inspirational speeches, and talks on a variety of subjects including education, writing, storytelling, productivity, and more. I’m represented by Macmillan Speakers Bureau. I’m also a professional storyteller who has performed at more than 60 storytelling events in the last three years and has hosted story slams for literary festivals, colleges, and more. I’m a 15-time Moth StorySLAM champion and GrandSLAM champions whose stories have appeared on The Moth Radio Hour and This American Life. If you need someone to entertain, inspire, inform, or emcee, contact me. Founder and producer of Speak Up: My wife and I produce a storytelling show called Speak Up. We are based in Hartford at Real Art Ways with additional shows at venues throughout the region, including local schools and The Mount in Lenox, MA. If you have an audience that would be interested in storytelling, or you’re a storyteller looking to pitch a story for one of our shows, send an email to speakupstorytelling@gmail.com. Minister: In the past ten years, I’ve married 13 couples and conducted baby naming ceremonies and baptisms. I’ll be marrying two more couples in 2015. If you’re getting married and are in need of a minister, contact me. Life coach: In the past four years, I’ve worked with four different clients, assisting them in everything from goal setting to productivity to personal relationships to career development. If you’re looking to make changes in your life and become a happier and more successful person, contact me. Tutor: I tutor students in grade K-12 on everything from general academics to college essay writing. If you’re the parent of a student in need of academic support, either regularly or occasionally, contact me. Storytelling and public speaking coach: For the past two years, I’ve been teaching storytelling workshops and coaching storytellers on an individual basis. People often take my workshops in hopes of performing in storytelling shows and competing in story slams, but they also take these workshops to improve job performance, enhance communication skills, and get their friends and family to finally listen to them. My real mission is to eliminate the scourge of PowerPoint from this planet, one story at a time. If you’d like to improve your storytelling, public speaking, and/or communication skills, send an email to speakupstorytelling@gmail.com and get on our mailing list. Writing camp coordinator and instructor: Last year my wife and I launched Writer’s Abroad, a four week long summer writing camp for students ages 11-16. We had an outstanding inaugural season and plan on an even better second year in 2015. If you are the parent of a child ages 11-16 who loves to write and/or could benefit from four weeks of intensive writing instruction designed to improve skills and inspire writers, this camp may be for you. Contact me. Presentation consultant: Since posting about this position a week ago, I have heard from two people who have expressed interest in hiring me for their fairly new companies at some point in the future. I may also have the opportunity to take on a partner in this business. If you are a person who delivers content via meetings, presentations, workshops, etc. and would like to improve your communication skills, contact me. Professional Best Man: Since posting about this position on this blog in 2011, four grooms and two reality television producers have inquired about hiring me for their weddings and television shows that are wedding related. Geographical constraints forced me to reject all their offers thus far. I am still awaiting my first gig. Productivity consultant: Since posting about this position on this blog in 2013, I’ve had one inquiry about my services. If you would like to become a more productive person in your personal or professional life and are willing to make changes in order to achieve this goal, contact me. Professional double date companion: Since posting about this position on this blog in 2011, I have had no inquiries. That does not mean the job is a failure. Just that it has yet to succeed. If you’re dating someone for the first time or have been on several dates and need that important second or third opinion on the person in question, contact me. Professional gravesite visitor: Since posting about this position on this blog in 2011, I have had no inquiries. That does not mean the job is a failure. Just that it has yet to succeed. If you have a gravesite in Connecticut in need of visiting, contact me. Don’t say goodbye to the bride and groom. Just leave. Let it be your final gift to them. Slate’s Seth Stevenson argues in favor of not saying goodbye. I am an enormous fan of ghosting. My wife, however, would never allow it. My wife’s goodbye ritual takes at least 20 minutes and includes the scheduling of at least one future social engagement and engaging in at least one conversation on an entirely new topic before the farewell is complete. For me, ghosting will never be a reality. Nor will it be for most people. Social conventions are incredibly difficult to change, and they are even more difficult to ignore for the vast majority of people. It takes a special kind of arrogant rule breaker to ghost on a consistent basis. As a wedding DJ with almost two decades of experience, I believe that ghosting at a wedding is not only acceptable but represents an act of kindness and generosity toward the bride and groom. Every weekend, I watch as brides and grooms are pulled off the dance floor during one of their favorite songs by friends or family members who feel the need to exchange idle, meaningless, and soon-to-be-forgotten pleasantries before saying goodbye. Don’t do it. Just leave. If there are 150 people attending the wedding (an average number of guests for the weddings that I do), that means that the bride and groom will need to say goodbye to approximately 75 couples. In the course of a five hour reception (also the average), that amounts to a goodbye every four minutes. Since most guests don’t start leaving four minutes into the reception, what it really means is a constant stream of goodbyes during the last two hours of the reception, when the bride and groom are supposed to be dancing with friends and family and having the most fun. Years ago, I would make an announcement with about 15 minutes left in the wedding imploring guests to join the bride and groom on the dance floor and stay for the last few songs so the bride and groom could enjoy them in peace. The announcement rarely had any impact on the selfish jackasses who thought that leaving 15 minutes early was more important than the happiness and enjoyment of a bride and groom on their wedding day, so I stopped making it. But if there was ever a social event to ghost, it’s a wedding. The bride and groom will never remember who did and didn’t say goodbye to, nor will it matter to them. I promise you: There has never been a bride or groom in the history of the universe who were concerned with saying goodbye to their guests in the midst of their reception. If saying goodbye is important to you, stay until the end. Wait for the music to stop and the lights to come up. Then say goodbye. Otherwise, just leave, damn it. Let the happy couple be happy. This is what happens when you work in the industry for 17 years. I am working at a wedding tonight as the DJ. I also served as the minister for the photographer’s wedding. Someone stole my idea for professional best man and made a movie out of it. Back in April of 2011, I proposed a new job: Professional best man. I defined the position, listed my many qualifications, and offered myself out for hire. Since then, three potential clients have attempted to hire me, only to be stymied by physical distance. Two lived outside the United States and the third lives on the west coast. But all three were serious about hiring me. Last year, I was contacted by a British man who was attempting to launch a similar service in his country and wanted to know if I had managed to land any clients. This week a friend pointed me to The Wedding Ringer, a Kevin Hart-Josh Gad film about a professional best man. The premise for Kevin Hart’s fictional business is a little different than mine. His character offers services to men without friends. I am offering myself as a second best man. The professional one. The best man that allows your real best man to relax, drink, and act irresponsibly. The best man who understands weddings better than most and will do the work necessary to ensure the success of your big day. But still, Kevin Hart’s version is close enough. You just watch. People are going to see this as a legitimate business opportunity and steal my idea. Professional best man services are going to pop up everywhere. Even worse, why didn’t I think of writing this film? I had this idea long before anyone involved in this movie did. Maybe I should look at my other proposed jobs and write movies about them before it’s too late. Grave site visitor and double date companion are just two on my list. Great job ideas, but maybe better movie ideas? "Pressure is a privilege." - Billie Jean King as heard on Fresh Air. I love this idea. It’s so true. Many of the things that I choose to do involve pressure. I stand before 21 students every day, knowing full well that I am responsible for their academic success, and that a portion of their future professional success is in my hands. I do not take this responsibility lightly. I worry about my students a lot. I write novels. I choose every word. I create every character, every setting and every scenario. Then I send my story into the world for public consumption and comment. The success of the book is based almost entirely on my ability to create a story that readers love. The viability of my writing career hinges on the success of each book. I am a storyteller. I stand before as many of 1,500 people at a time and share a true story from my life in hopes that they will be entertained and moved. If I am competing in a StorySLAM, my story will immediately be followed with a numerical assignation of my performance by teams of complete strangers. I am a wedding DJ. I am the person most responsible for the most important day in the lives of the couple who have hired me. Along with my partner, we coordinate every minute of the wedding. I feel more pressure on a person’s wedding day than any other day of the year. I understand how important this day is to them. There are days when I yearn for a less pressure-filled life. I recently saw a parking garage attendant sitting in a booth, reading a book, listening to music. While I understand that the person in that booth doesn’t earn as much as someone in my position, I found myself envious of him just the same. He was getting paid to perform a simple, stress-free job that allowed him to read a book and relax while on the job. There are days when that sounds damn fine. But Billie Jean King was right. Pressure is a privilege. It leads to a full, rewarding, memorable and meaningful life. Another wedding season has drawn to a close. Now that my DJ partner and I don’t advertise and actively turn away weddings that don’t appeal to us, we are doing considerably fewer gigs each year. We did a total of 8 weddings this year, down from our record total of 48 several years ago when we were actively pursuing business and promoting our company. I served as minister and DJ at last weekend’s wedding, a dual role that I seem to be doing a lot lately. People apparently like the one-stop shopping aspect of the DJ/minister. Even though I’ve only worked 8 weddings this year, I am not without a handful of stories, wedding advice and lessons learned from my 17th year as a wedding DJ. If the number of photographers on the dance floor during the newlyweds’ first dance meets or exceeds the number of people actually dancing, you have done something seriously wrong. Guests should not be craning their necks around two or more photographers in order to catch a glimpse of the bride and groom dancing. At my most recent wedding, for example, the bride and groom enjoyed their first dance while two photographers stood side by side with them on the dance floor, less than 10 feet away,and a third stood just off the dance floor, also obstructing the guests. At the most, there should be one photographer on the dance floor at any one time, and if the dance floor is small enough (as this one was), is it too much to ask to stand just off the dance floor for most, if not all, of their dance? The cake cut is not a photo-shoot. It is a ceremonial event that should be enjoyed by the bride and groom with minimal intrusion from any of their vendors. As such, wedding photographers should not be the ones directing the newlyweds through the cake cutting process. The result is often a stilted, disjointed affair that provides the photographers with ideally posed shots and superior angles but strips the fun of the experience from the bride and groom. If you need to pose a shot or two before the cake cutting begins, fine. But then back the hell away. At my most recent wedding, the photographers directed the entire cake cut, nudging me out of the process entirely. There were three of them. I was outnumbered. As a result, the bride and groom’s every move was choreographed, paused, adjusted and paused again before proceeding. It wasn’t a cake cut. It was a series of frozen moments designed to maximize the photographer’s performance. When I started working as a wedding DJ in 1997, the world was damn near prehistoric. My partner and I started our DJ business 17 years ago on a whim. We had no experience and no equipment but thought we could make it work. Since 1997, we’ve performed at more than 350 weddings. Over the course of that time, I’ve also married more than a dozen couples. We’ve done two weddings for the same groom after a divorce and second marriage. Smoking was still permitted in most wedding venues. Digitized music did not exist. Every song that we played was purchased at a brick-and-mortar store. There was no online mapping website or software. Directions to wedding venues and client’s homes had to be taken over the phone and written down by hand. Seventeen years is a long time to be doing anything.